Here’s a piece that was completed last week. 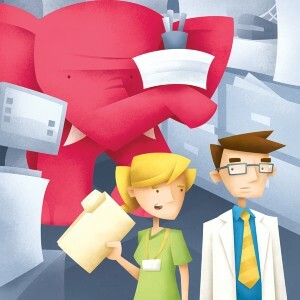 The end client is in the business of helping medical pros with their organizational systems, and the elephant refers to changes coming down the province’s pipeline that nobody wants to deal with until it’s too late. Thanks to Randy at Mythographics for being fun to work with on this one. I was actually able to meet him over coffee a couple of times. It seems that it’s a rare but pleasant occurrence that I can meet the people I collaborate with.